Breast imaging is the examination of the breast to demonstrate any changes and abnormalities using mammography and/or ultrasound. A mammogram is an x-ray test of the breast tissue. It can provide information about lumps, calcifications and other abnormalities that may be present in the breast. It is also available for screening purposes for women without any breast problems. Breast ultrasound uses sound waves – not radiation – to show breast tissue. A breast ultrasound can show areas of the breast, including the areas closest to the chest wall that are difficult to see in a mammogram. Breast ultrasound is used to check any abnormalities in the breast and provide further information. 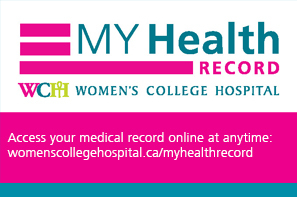 At Women’s College Hospital, there are three digital mammography units and two ultrasound units in the breast imaging department. Our centre is accredited with the Canadian Association of Radiologists Mammography Accreditation Program (CARMAP). Our breast imaging centre at Women's College Hospital is an Ontario Breast Screening Program (OBSP) assessment site as part of our proud partnership with Cancer Care Ontario. The OBSP is a self-referral screening mammogram that does not require a requisition from your family doctor. This program is for Ontario women only, aged 50 to 74 years old, who have no previous history of breast cancer, no implants and no current breast symptoms. IMPORTANT - for all exams (except for OBSP self-referral screening exams), you will need a signed requisition form from your referring doctor. It is necessary to bring or send to us any previous mammogram exams done at another facility. You will be asked to complete a medical history form before starting the test. Having a breast imaging exam? Click on one of the following options for more information on what to expect. A screening mammogram usually takes two pictures of each breast: one from the top and one from the side. You usually stand up during a mammogram, although you may be asked to sit in front of the machine. Your breast will be placed on a flat surface. Another plate is then pressed firmly against your breast to help separate the breast tissue. Compression is important to separate the breast tissues in order to produce a clear image. Without compression the tissues will overlap and we will get less information. Your breasts may be sore for a few days, especially if you have very sensitive breasts. In this case, it is best to have your mammogram done two weeks after your period has ended. Before the start of the test, please inform the technologist if you have sensitive breasts; fragile skin; back, shoulder or neck problems. You will be asked to lift your arm and/or use your hand to hold your other breast out of the way. You will need to hold your breath for few seconds while the x-ray picture is being taken. The technologists will review the images for correct positioning. What do I need to do to prepare for a mammogram? Wear two-piece clothing since you will be asked to undress from the waist up, and remove any jewelry. You will be given a hospital gown to put on. Do not apply powder, lotions or deodorant on the day of your test. During the compression you will feel tightness on your breast area for a few seconds. You will be in the department for approximately 30 minutes or longer depending on the complexity of the examination. A breast ultrasound is used to examine the breast tissue for abnormalities, but it is typically not used as a screening exam. It may be used to provide further information to the radiologists (doctors that interpret your images and provide your doctor with a report). For a breast ultrasound, you will lie on your back with your arm raised above your head on the examining table. A transducer (also known as an ultrasound probe) connected to the ultrasound machine will be used to examine your breast. The technologist applies a water-based gel to the breast to help the transducer make secure contact with the area being examined and eliminate air pockets between the transducer and the skin. The ultrasound technologist will press the transducer firmly against the skin and glide it over the area of interest several times. What do I need to do to prepare for a breast ultrasound? Wear two-piece clothing since you will be asked to undress from the waist up, and remove any jewelry. You will be given a hospital gown to put on. If scanning is performed over an area of tenderness, you may feel pressure or minor pain from the transducer. If so, please inform the technologist. Approximately 30 minutes or longer depending on the complexity of the case. No follow up care is required. This procedure is used to investigate the ductal system or milk ducts of the breast, and to determine which duct is having discharge (fluid). It involves an injection of an x-ray dye (or contrast) into the milk duct. This can be done with ultrasound or with a mammogram. You will lie on your back on the examination table and the radiologist will disinfect (clean) the breast area with disinfecting solution. Using Ultrasound, the radiologist will locate the duct and insert a small tube. You will then be transferred to the mammogram room and pictures will be taken in two different positions. Once the procedure is completed the tube will be removed. Eat as you normally would before you come for your appointment. Wear two-piece clothing since you will be asked to undress from the waist up, and remove any jewelry. You will be given a hospital gown to put on. Do not apply powder, lotions or deodorant on the day of your test. You may bring a family member or friend to accompany you to the exam. Because this exam requires both ultrasound and mammogram, the average time for this exam is 1.5 hours. Please always give yourself an extra hour. This procedure uses x-ray and is used to provide tissue sampling for microcalcifications seen under mammography. You will either sit or lie on your side with your breast compressed between two flat plates. We will make you as comfortable as possible since it is very important that you do not move during the entire procedure. The radiologist will freeze the area to be biopsied with local anesthetic. Several tissue samples will be taken and the specimens will be x-rayed to see if they contain flecks of calcifications. A mammogram will be performed during the procedure as well. Feel free to eat as you normally would. We suggest you wear comfortable clothing. If you are taking an anticoagulant (blood thinner) or aspirin regularly, please talk to your doctor, as the biopsy can not be performed unless these medications have been stopped for an adequate period of time. You will feel pressure with slight pain during the procedure. The exam will take approximately 45 to 60 minutes. However, after the biopsy has been completed, you will remain in the department for 15 minutes for observation. Please try to take it easy and relax after the exam. You will be given a post-biopsy care instruction guide. The biopsy samples require five to 10 days to process, after which your doctor will receive a report. Results will be discussed with you by your doctor. This procedure uses x-ray and is used to provide tissue sample for areas seen under mammography. You will either sit or lie on your side with your breast compressed between two flat plates. We will make you as comfortable as possible since it is very important that you do not move during the entire procedure. The radiologist will freeze the area to be biopsied with local anesthetic. Several tissue samples will be taken and the samples will be x-rayed. A mammogram will be performed during the procedure as well. Eat as you normally would. Wear comfortable clothing. If you are taking an anticoagulant (blood thinner) or aspirin regularly, please talk to your doctor, as the biopsy cannot be performed unless these medications have been stopped for an adequate period of time. Take it easy and relax after the exam. You will be given a post-biopsy care instruction guide. A breast ultrasound-guided fine-needle aspiration biopsy is performed to collect fluid or cells for analysis to give a more accurate diagnosis. You will be asked to lie on your back on the examination table, as you would for a regular breast ultrasound. The radiologist will locate the area of interest and will freeze the area with local anesthetic. Once the area is frozen, the radiologist will use a fine needle to take several samples. Wear two-piece clothing since you will be asked to undress from the waist up and wear a hospital gown. You will also be asked to remove your jewelry and should not apply powder, lotions or deodorant on the day of your test. We suggest that you come with a friend or family member on the day of your test. This procedure is approximately 45 to 60 minutes. After the biopsy you will remain in the department for another 15 minutes for observation. You will be given a post-biopsy care instruction guide. You should take it easy for the rest of the day. This procedure is used to localize areas of the breast for surgical removal by the surgeon. You will be asked to lie on your back on the examination table. Using ultrasound guidance, the radiologist will locate the area of interest and freeze it with local anesthetic. The radiologist will insert the needle guide until it reaches the area. The needle is removed and a guide wire remains hooked in the area for the surgeon. The technologist will take two mammogram pictures with a small amount of compression to check the location of the guide wire. You will be taken back to the surgical daycare department after this procedure is complete. Your instructions and preparation will be given to you by the surgical daycare department. You will be in the department for approximately 1 hour depending on the complexity of the examination. Your followup instructions will be explained to you by the surgical department before you go home. A verbal report is sent to your doctor while you are still in the operating room.